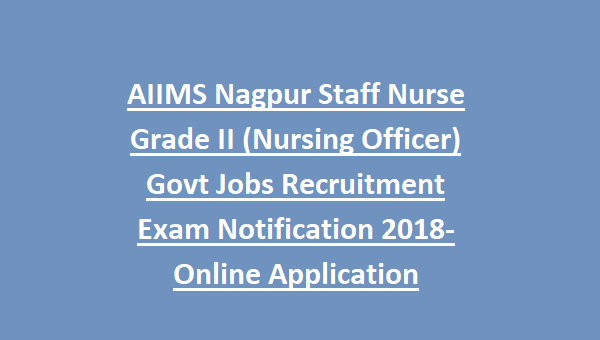 are total 16 Nursing Officer posts in this AIIMS Nagpur Recruitment 2018. Online applications are received through the official website of AIIMS Raipur at www.aiimsraipur.edu.in. for this AIIMS Nagpur Staff Nurse Grade II posts. Candidates will be selected based on Computer Based test only for these AIIMS Nagpur Staff Nurse jobs. 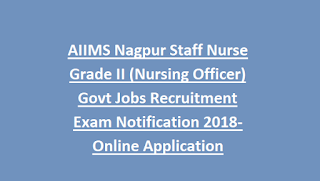 Written Exam Pattern and syllabus, qualification, salary, age limits, online application procedure and other details of AIIMS Nagpur Nursing Officer Jobs recruitment exam 2018 notification is given below. There are total 16 posts in this AIIMS Nagpur recruitment 2018. Category wise vacancy details are mentioned below. -B.Sc nursing or GNM Nursing with 2 years experience in 50 bedded hospital. -Must have good knowledge of computer usage. -Must have registered with respective Nursing Council. For Nursing Office posts age limits are 21-30 years for general. For OBC 21-33 years, for SC/ST 21-35 years. 2. For Women/SC/ST candidates application fee is nil. Candidates selection will be held in 3 stages. Computer Based test consists of 100 questions. Exam will be conducted for 100 marks. Computer Based test duration is 90 minutes. Exam Syllabus for Nursing Subject will be B.Sc Nursing Degree academic syllabus. For other topics syllabus will be intermediate level. Apply online for this AIIMS Nagpur Nursing officer jobs through AIIMS Raipur official website of www.aiimsraipur.edu.in. Last date submission of online application form for this AIIMS Nagpur recruitment is 12-10-2018.